The George Washington University (GW) Postdoc Association (GWPA) hosted Postdoc Appreciation Day on Sept. 21 as part of the National Postdoc Association (NPA) Postdoc Appreciation Week from Sept. 17–21. The event included a Postdoc Research Competition and Awards Ceremony and a Careers after PhD Networking Luncheon. Highlighting the day’s activities was a keynote address by entrepreneur and FDA Program Manager Josh Henkin, PhD. The GWPA is dedicated to enhancing the postdoctoral experience at GW by establishing a sense of community among GW postdoctoral researchers, serving their needs and concerns, and providing them with career development training, counseling, and mentorship. The annual Postdoc Appreciation Day is an extension of that mission, promoting social and academic interaction between postdoctoral researchers across the many disciplines. As a program manager at The Tauri Group, Henkin provides management support, strategic planning, risk management, and FDA regulatory expertise to teams that provide technical and programmatic support to Department of Defense vaccine and therapeutic development programs. He is the founder of STEM Career Services, a career coaching firm for science, technology, engineering, and math (STEM) job seekers looking for careers outside of academia. Henkin also is a member of the NPA Board of Directors, and he is a Career Development Center expert with American Association for the Advancement of Science. In his keynote address, titled “Now, Pick A Winning Career” (National Postdoc Appreciation Week), Henkin discussed the sometimes harrowing transition to non-traditional science careers following graduation. Among his advice, Henkin suggested avoiding job seeking pitfalls by thinking broadly about career options that tap into skills that bridge their current biomedical experiences to the non-academic world. For instance, Henkin said, analytical skills can translate to market research positions, while scientific knowledge can be beneficial in technical sales or consulting. Henkin’s slide presentation is available for download at postdocs.gwu.edu/resources/. For the second year, GWPA hosted a research competition. This year, 13 young scientists presented their abstracts in a 12-minute TED-talk format, followed by a brief question and answer session. 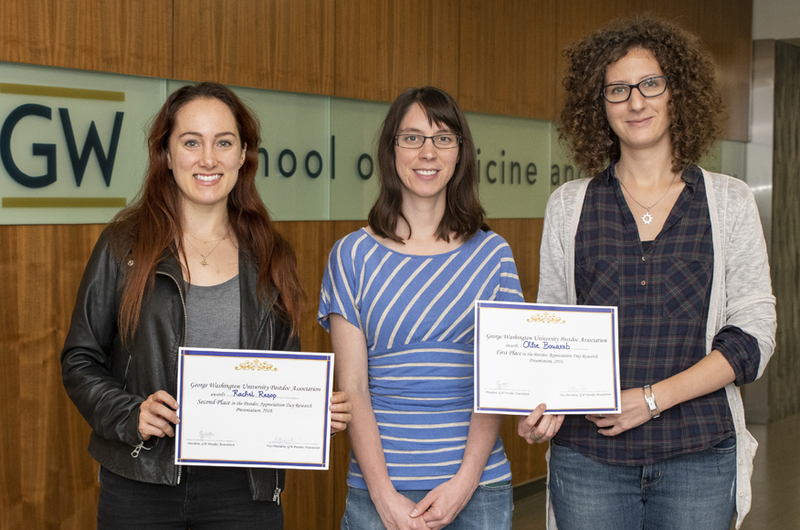 Winning presentations came from Chloe Bouarab, Department of Pharmacology and Physiology in the School of Medicine and Health Sciences (SMHS); Rachel Resop, Department of Microbiology, Immunology, and Tropical Medicine in SMHS; and Sarah Jaumann, Department of Biology in the Columbian College of Arts and Science, who received cash prizes of $500, $300, and $200, respectively. New to Postdoc Appreciation Day was the addition of the Gold Star Postdoc Award and the GWPA Mentorship Award. The inaugural Gold Star Postdocs, Kedar Aras, Department of Biomedical Engineering in the School of Engineering and Applied Sciences; and Derek Jones, Department of Medicine in SMHS, were selected based on their important contributions to GWPA. They received travel expenses to attend the 2019 National Postdoc Association Conference in Orlando, Florida. Assistant professors in the Department of Microbiology, Immunology, and Tropical Medicine finished first and second in voting for the GWPA Mentorship award. Alberto Bosque-Pardos, PhD, MBA, received first place honors, while and Katherine Chiappinelli, PhD, was the runner-up. Bosque-Pardos Mentoring is a crucial component of postdoctoral training that can shape the career and future of the postdoc. Nominations for the GWPA Mentorship Award came from GW postdocs.